The SEN Code of Practice 2001 has recently undergone a total overhaul which started with various consultations beginning in 2010 that finally culminated with the new SEN Code of Practice (‘CoP’) 2014 on 28 July 2014. 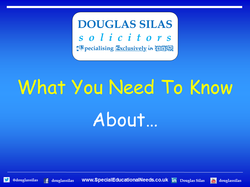 The new SEN Code of Practice came into force on 1 September 2014 and is statutory guidance based on Part 3 of the new Children and Families Act 2014 (and other associated regulations). The SEN CoP 2014 applies to LAs, maintained schools, pupil referral units (‘PRU’), academies, free schools, non-maintained special schools and colleges. They must all take account of the CoP when dealing with children and young people with SEND. There are 11 chapters in the CoP. Within each chapter there are various sub-headings, including but not limited to the information provided below. Who are information, advice and support for?